And so another year of the Hay Festival comes to an end. I’ve never been, but every year when I see who’s going to be there, I want to go too. It’s the wrong time of year for me. I know there is a good reason it’s always the half term week, but that was always when we went elsewhere. Also, the potential difficulty of finding accommodation, as well as negotiating the famous mud puts me off. That’s not all in the off-putting category, either. They don’t pay, in Hay. I’ve had a week of following the online discussions between authors regarding this. Somehow they are not totally keen on not being paid. I wonder why? They do get ‘paid’ of course. In wine. They also often travel to this slightly out-of-the-way Hay by train. Long distances for many. Which means that many of them are forced to decline being ‘paid’ at all. Although, someone mentioned that there is a welly alternative. So if you can’t take the wine, you can – maybe – have a pair of wellies. Which you might not need. And if it was me, they’d not fit me, due to having welly-unfriendly lower legs. In fairness, it seems it’s not only authors who are not given money for their trouble. There are interns, who are also just there for the pleasure of, well, of being there. The answer is – naturally – for the participants to stage a strike. But those who need the money also want to be appreciated and invited to events. So they won’t [can’t]. And former presidents and big stars/celebrities quite possibly neither need paying, nor are likely candidates to join in a strike. There was a launch of Sixteen String Jack and the Garden of Adventure at Moat Brae House this week. The garden at Moat Brae was the one that inspired J M Barrie to write Peter Pan, after he used to play with the boys who lived there. Plans to create a new Neverland Garden at Moat Brae, in Dumfries, are part of a bigger scheme to have a National Centre for Children’s Literature and Storytelling, where children will be able to come and play in Peter Pan’s garden. Joanna Lumley is Patron of the Peter Pan Moat Brae Trust, and she’s excited by the new book, which will hopefully help them raise the necessary funds. 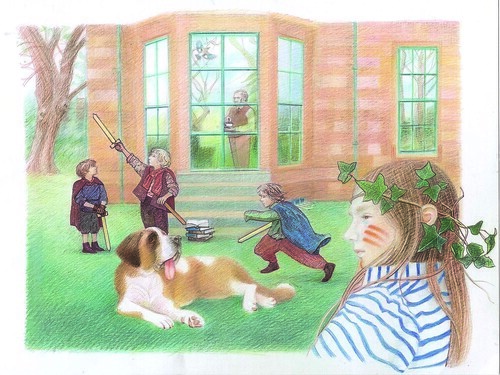 The book by Tom Pow and illustrator Ian Andrew is set in the garden as it is now. Daisy has come with her grandmother, who tells her the stories she used to hear from her grandmother, who was a maid in the house at the time J M Barrie came to play. Maybe. She’s fictional, but this picture book shows how child’s play might have influenced the creator of Peter Pan, all those years ago. I’ve been having witchy feels for weeks, so it’s hardly surprising it went like this. 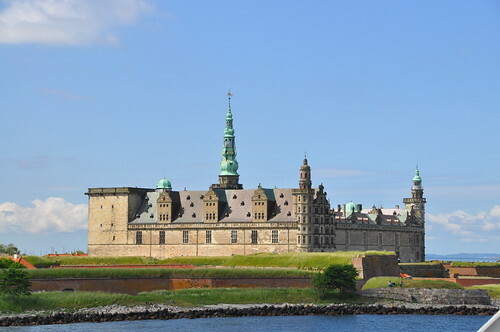 It won’t be obvious to everyone that the way to get to Holiday Bookwitch Towers is to fly to Denmark. You know, fly to one country when you aim for another. But you can just about get used to that. However, flying to Norway to fly to Denmark to eventually cross over to Sweden, strikes me as excessive. It’s not quite a U-turn; more like two sides of a triangle (although I’ve not looked at a map for a while, so could be wrong). They cancelled our direct flight, and sent us to Oslo where, as the captain said, it was a pleasant 8. Degrees, I believe. Not pleasant at all, and extremely wet. They were fussy, too, discovering the Kindle I had omitted to take out for the second lot of security checks of the day. Edinburgh didn’t even notice. In my boycotting-stupid-trains-mode, we hired a car, as Son had found a rental that was so cheap it would have been silly not to. And then we didn’t cross on The Bridge (which is what sensible – or did he call them normal? – people do, according to the Resident IT Consultant) because I, well, I didn’t feel like it. We got the ferry instead. 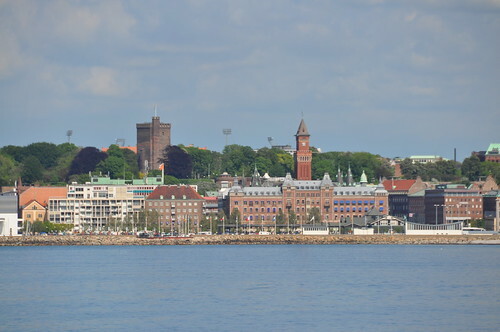 We hit Helsingør ferry terminal at 19.30, and even with fussing over the ticket buying, we were on the ferry, car and all, for the 19.40 departure. There is no end to Danish television ties here. It was pure Borgen on the way, as I gather they have just called an unexpected election (unless they were merely trying to prevent Mr Cameron from visiting). On the other side we found a Lidl car park to stop for a five minute food break, so it was all good. The Resident IT Consultant accidentally hit the hot-seat button, so got rather warm before he found the off-button, but since we’d been warned it was going to be cold here, that might not have been a bad thing. We could be in for more pleasant 8s, if we’re not careful. This is the best book Sally Nicholls has written – so far – and she has written some really good ones. 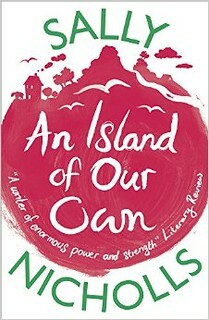 An Island of Our Own is that perfect thing; a tremendously good children’s book. Written as though by 13-year-old Holly, who is an orphan, living with her 19-year-old brother Jonathan who is official carer of her and their brother Davy who is seven, Holly wants new school shoes and Davy wants a bike. And for his pet rabbit to get well. This costs money they don’t have, especially as they live in London, and when their rich great aunt Irene dies, they embark on an only slightly crazy quest for their inheritance. As it says on the cover, this really is a book about home-made spaceships, lock-pickers, an exploding dishwasher, and Orkney (my second Orkney book in a short time). But most of all it’s about love, and resilience. Jonathan makes a far better ‘parent’ than many ‘real’ fictional parents, and it’s heartbreaking to think of this boy who was all set to go to university and had to give it up, and who cries in secret when he can’t find the money they need to pay for Sebastian’s (that’s the rabbit) care or the effects of the dishwasher incident. There is something so very light about Sally’s writing. Her topics are serious, but she turns everything into sheer delight, and you smile and you cry. And you want to read the book again. There is a difference between what people say they will grab as they run out of their house, if it’s on fire, and what they will really do. I can understand the feeling that family photos are important, but they are an impractical thing to grab (unless you have prepared a small folder of the most valuable pictures you have, which just happens to sit by the likely fire exit), and these days you could have everything saved in cyberspace. The other week Anthony McGowan asked me which book I’d take if my house was on fire. I am guessing he wanted to know which of my many volumes I value the most. I turned the question round a bit, by saying that I’d been in this situation, and my experience tells me I couldn’t care less about any books. When it became clear that night thirteen years ago that it might be prudent to leave, I simply took my two Offspring and sought ‘asylum’ in the house next door. The Resident IT Consultant was doing stuff to the stoptap in the basement, but was eventually prevailed upon to grab his senses and come with us. In the end this was not too bad a fire, as it was discovered in time. But I learned that belongings of any kind don’t matter. Only people. Pets if you have them. But I tried to answer Anthony’s question, after I’d disconcerted him with my experience of this. And it’s not necessarily the story as such, since most books can be read after a fire by buying or borrowing a copy of it again. So I thought about signed books. Were any of them more valuable to me? No. Signatures are fun, but unless you can make a fortune selling them, there is more value in remembering how and when the signing happened, than the actual scribble in the book. Doodles, however, are different. I mean, works of art. Some people spend a lot of time and effort on embellishing that page in their book for you. And when I’d got that far the answer was relatively easy. 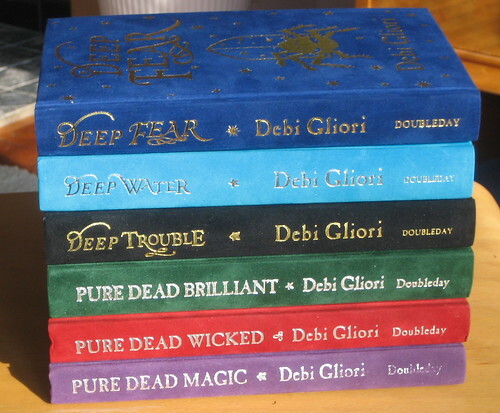 I have six lovely, velvety novels by Debi Gliori, with the most glorious ‘doodles’ on the title pages. ‘I reckon it’s junction 5,’ I said to the Resident IT Consultant. We were on our way to deliver some books to the librarian of my dreams, Anne Ngabia at Grangemouth High School. You might remember me mentioning Anne before, when she talked about her other libraries, in Kenya, at the Falkirk RED awards. After some years abroad, she’s returned ‘home’ to collect more books for Kenya, and this is where I felt she’d be really useful to me. Anne will welcome almost any book as long as they don’t bear the words manual or catalogue. So for a while I’ve had these boxes with her name on, sitting waiting to be taken to Grangemouth, and from there to Kenya with kind assistance from the Army. So there we were, nearing junction 6, and the Resident IT Consultant really wanted to leave the motorway there, because it looked right. I was feeling generous, so I let him. I was right, and he came to the same conclusion quite soon. But we found Grangemouth High School in the end, and let’s face it, the detour was good, because otherwise we’d have been too early. And we – he – only had to make two U-turns. Anne was busy with a storytelling session, which is why we couldn’t be too early. (I’ve never come across a school librarian doing that before. Storytelling, I mean. Offspring’s school didn’t have anything like that.) As we approached, we saw the street was lined with parked cars. I wondered what might be on, to have caused them all to be there like that, in the middle of the day. ‘They’re probably here for the storytelling,’ said the Resident IT Consultant. While he blocked in some parked cars in the school car park, I made a successful attempt to enter, and found they were indeed expecting some woman with books. Their librarian was summoned, and I enjoyed the brand new freshness of Grangemouth H S as I waited in reception. Together we negotiated corridors and lifts with those book boxes, and we had the opportunity of admiring her lilac painted library, where Anne was next going to have a Mad Hatter’s tea party (two things in one day?). If anyone else is bothered by possessing too many books, then the Army is waiting to convey them to eager readers in Kenya. If you don’t know it, it doesn’t exist. Or so it seems. I was intrigued to read a travel article in the Guardian about the islands along the North Carolina coastline, where its author Douglas Rogers had not been aware that this state has lovely beaches. That it’s not just Cape Cod or Florida that matter on the east coast. I’ve never been, so in a way I’m clearly more ignorant than he was. But, I had one thing going for me; I used to read – far too many – romantic novels. And I mean the Mills & Boon/Harlequin type. The American ones I found to be not only fresher than the UK old style romances, but really most educational too. No, not in that way. Geography, lifestyle, idioms, food. That sort of thing. Even if a romantic novel is likely to idealise life and love, I assume that what people eat, and the region in which they live, will still be relatively authentic. So, I knew, and liked, islands like Hatteras and Ocracoke a long time ago. I felt I’d like to visit, if it weren’t for the fact that to begin with it’s the other side of the Atlantic, and then NC is some way away, and the islands even more so. The description the Outer Banks, makes me feel agoraphobic just thinking about the journey there. I’m most likely not going, but I do reckon they sound just my kind of place. I can’t remember a thing about any of the actual romances set there, but the islands themselves remain strongly in my memory. Which just goes to prove that reading broadens the mind, [almost] whatever the book it is.